At Sway Group, we’ve been all about influencer and content marketing since our inception. As the industry grows, we are thrilled to see so many brands engaging influencers as part of their marketing strategy. Less exciting, however, is the way in which some influencer platform companies are positioning influencers as a commodity. Just go to your software of choice, enter your preferred demographics, and voila! A list of influencers. Ready to go. Right? Wrong – they are not a commodity! The truth is that influencer marketing is more art than science. Yes, certain pieces of software can help to identify influencers who fit a certain demographic, but there is so much missing from the equation if a software is your only go-to for your influencer marketing needs. Make sure you are hiring influencers who can create high-quality content that authentically promotes your brand in a style that fits into the organic feel of their platforms. The great thing about working with influencers is that they have the ability to translate your brand messaging into a relatable and authentic story that draws readers in. That said, it is important to check out past sponsored work from the influencers on your list to ensure that their voice is a good match for your brand. Most software programs can’t tell you whether the influencers you are about to work with on your brand’s high-visibility campaign are dependable or not. Do they get their work in on time? Are they consistent in following directions? Will they disclose properly? Can you get all of the above without massive hours of QA on your part? At Sway Group, our QA department is the backbone of every campaign – they review every single piece of content that our influencers create to ensure that your brand is being highlighted in the most authentic and FTC compliant way possible. Say it with us… influencers are more than just a number! You may encounter some influencers with high traffic numbers but terrible engagement rates. If you are trying to move the needle in terms of purchase intent, this likely isn’t helpful to your brand. 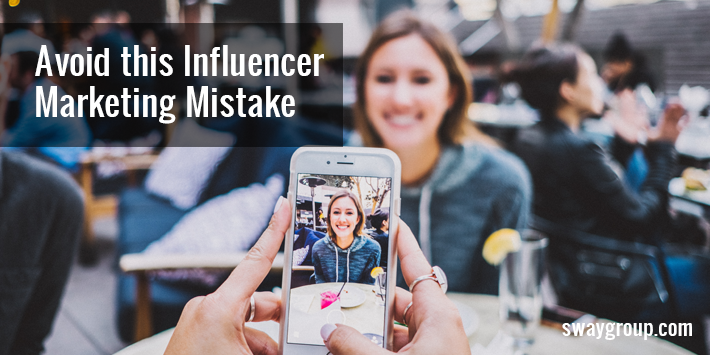 We often find that working with micro-influencers might be a more effective strategy for many brands, so don’t make the influencer marketing mistake of choosing influencers based on numbers alone. You would be surprised how many of these micro-influencers have true and engaging relationships with their readers. Virality – the golden buzzer word of the influencer marketing industry. When you partner the right brand with the right influencer who creates amazing content, their output will have the best chance to go viral. We have said it once and we will say it again – making sure that your influencers are creating authentic and relatable content is the best way to increase your chances of your sponsored content hitting it big on social media.